I am really sorry that I haven't update my blog for LONG LONG.... time!! I have gone back to my hometown, Tainan City, Taiwan on June. We spent 5 weeks overthere, and I have bought my daughter Misha back home to see my parents. My mum have seen Misha when she was born, but my dad didn't, so that was his first time to see his grand-daughter! 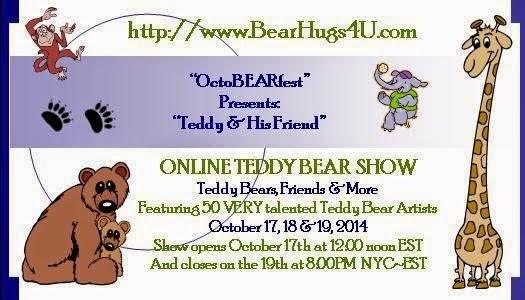 Then when we came back, I started REALLY busy to make bears for Who is Who in Bear making online bear show. 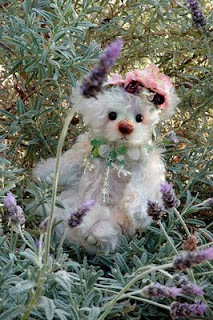 As well as this flower fairy bear for Spring Challenge on Teddy Bear and Critters -- Australiasia. This flower fairy is very beautiful, she has velvet flowers decoration near her left ear, and a very special necklace to give her a nice touch! When I took this Spring Challenge, I was thinking about a "tea bear" and a "cake bear", the "Morning tea in Spring morning" bear set. But I wasn't have enough time to finish 2 bears, so I made this flower fairy instead. I will still do that bear set in the future, because I love to do this idea for a very long time!